Maximize all aspects of your direct selling business, including complex commission structures, mentorship programs and party plan models with our Direct Sales CLOUD ERP. This comprehensive Direct Selling software is specifically designed and built to manage direct selling, network marketing, or multilevel marketing companies. Assist is the next generation of communications for the direct sales industry with a real-time, robust, internet-based back office that distributors and consultants use to manage teams, downlines, parties and sales. Quickly view monthly personal volume totals, team totals, compensation plan metrics, current ranking, customer details, activity timelines and place and track product orders. Assist manages the entire online sign-up process organizing sponsor relationships and teams. Step-by-step instructional videos provide a comprehensive guide for joining the business walking a potential distributor/consultant through the opportunities and responsibilities. Corporate, branded websites, personalized with the distributor's information provide a professional online presence to promote, recruit and market. Corporate-controlled marketing pieces, videos and presentations can easily be managed and downloaded from the reps replicated website. Tracking and reporting provides sales reps with data on who is visiting their site and from where they originated enabling them to create contact lists to grow their network. The full-featured back office offers distributors a real-time dashboard into the Assist direct sales system. The portal enables reps to view their personal sales data, teams sales data and other real-time transactions to make informed decisions and plan the monthly sales tactics to reach individual ranking goals. Direct selling organizations rely on individual distributors or consultants growing networks and reaching higher and higher levels of ranking. With Assist Direct Sales ERP, reps have access to the information, marketing and business tools they need to help them reach their goals. Assist allows you to create different compensation and commission plans for various ranking levels, product line or distribution channel. Organize the compensation according to margins, total volume, or any way you choose. The system is flexible, scalable and offers myriad ways to set up payments and commissions according to your business needs. Consultants and distributors can view downline sales, both individual and group, and review details about activity, scheduled parties, and other information, then send messages to their organization. Real-time data about the success of their organization allows distributors to better motivate and develop individual and teams. Sales data is calculated immediately in real-time and transactions are complete and reconciled. Deposits are made immediately into the company accounts and direct deposits can setup to pay commissions monthly, weekly or on any frequency desired. Hostess credits, RMA's, commissions and other payments can be delivered via corporate-branded payment cards. • Party calendars: View upcoming parties, past parties, guests, and hostess info. • Review party sales and commissions. • Hostess rewards and credit system. Assist provides all the features to manage the business fundamentals of your party plan business and allow you to focus on building your success. The corporate office has a real-time view of all consultant parties, events, shows, guests and hostesses. We understand that party plan companies have different needs than other types of direct selling companies so we have developed the industry-leading features to make it easy to empower your field. Assist is the perfect party plan solution because it is flexible, scalable and integrated with Assist supply chain management and other modules. The software is completely customizable and can be designed to manage your unique business model, and then grow as you grow. • Revenue and payout comparisons. • View graphical downline data. Corporate administrators can view the key performance indicators of the entire sales organization down through the ranks, both individuals and teams. Team leaders can be recognized and sales reps who need support and/or guidance can be identified. Financial data can be viewed in myriad formats and through dozens of standard reports. Assist SFA automatically records all the stages of the sales process. It includes a contact management system which tracks the interactions that have been made with a given customer, the purpose of the contact and any follow up that may be needed. This ensures that sales reps, distributors and consultants are not duplicating their efforts and can then contact more potential customer and recruits. Generate an unlimited number of tasks for existing opportunities with customizable categories and multiple opportunities for each contact. View the history of an opportunity, assign multiple personnel, and estimate the actual closing dates. Create and manage quotes on each opportunity. Track projected revenue and other close data with a single click. Work with sales force automation tools directly within the CRM and accounting functions to better integrate your business. Create mailers and mail merge letters, offers and contracts to customers. • Product descriptions in either short or long listings. • Support for detailed product information. • Multiple levels of up-selling for complementary products. • Post down loadable documents for products. • Image gallery capability of multiple images for attributes. • Integrated SEO for easy entry of keywords. • Allows creating custom web pages featuring any products. • Web support for discounts to be applied to specific customers or resellers. • Browse personal and organization orders, track shipments and email invoices. • Allows direct, real time access to robust product database management. • Multiple views when accessing product line. • Controlled access by date, customer type, event. 1. View upcoming parties, past parties, guests, and hostess info. 2. Hostess rewards and credit system. 3. Real-time view of party sales and revenue. 4. Replicated websites for consultants. 5. Extensive product catalogs and ecommerce solutions. 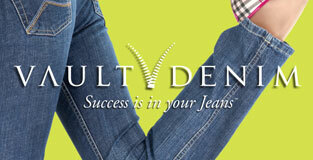 Vault Denim is a direct selling company that markets jeans and skin care products through a network of independent distributors at home parties. A complete brand identity was devleoped for Vault Denim including identity, website and marketing collateral.